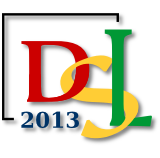 DSL 2013 is a ten-days intensive summer school organised by the Faculty of Mathematics and Informatics targeting the research in domain specific languages. It is the 5th summer school organised within the framework of the Central European Functional Programming School (CEFP), organised between July 8-20, 2013 in Cluj-Napoca. A regular outcome of the summer school is a Springer LNCS volume of revised papers that includes the topics presented in the school. Domain specific languages specialise for a restricted application domain, providing specific optimisation routines or functionalities for producing – provably – safe codes. The main goal of the school is to bring together researchers as well as graduate and PhD students for learning and understanding the open issues and the various development phases as well. The lecturers are among the most prominent researchers in the field (see the http://dsl2013.math.ubbcluj.ro/lectures.html page) and they will present the state-of-the-art in their field.